I've done a lot of tweeting about streak-related developments over the past few months (see link to my Twitter feed in the right-hand column), rather than writing deeper analyses. However, I've now conducted a detailed analysis of the L.A. Dodgers' 42-8 spurt midway through the 2013 season (one of best 50-game stretches in MLB history). My article is available at the baseball website Seamheads.com. The Pittsburgh Pirates won their 82nd game of the season last night, 1-0 over the Texas Rangers, to ensure the Steel City franchise's first winning (above .500) season since 1992. The Pirates' streak of 20 straight losing seasons was the longest such streak in any of the four major sports leagues in North America (MLB, NFL, NBA, and NHL). I created the following graphic to indicate how many wins the Pirates attained from 1993 (the year the string of losing seasons began) to the present. The break-even point of 81 wins is highlighted. Unless you have amazing eyesight, you'll probably want to click on the graphic to enlarge it. Congratulations to the Pirates and their fans. Not only has this year's team ended the franchise's record streak of losing seasons; it is a virtual cinch to make the playoffs (Pittsburgh's probability of making the playoffs is currently listed as 98.7% on ESPN's standings). 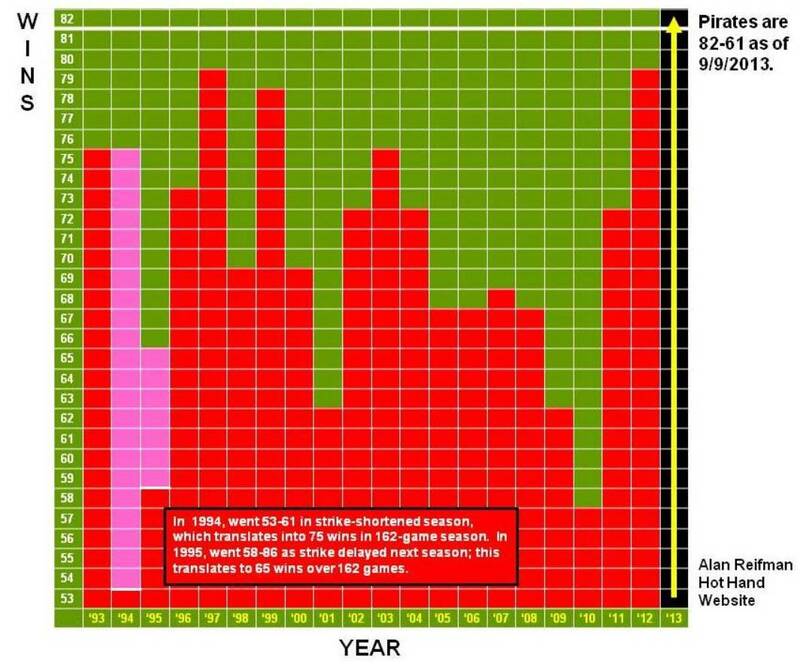 I like that the Pirates have achieved a winning record relatively early, rather than taking things down to the final days of the season. On a night when San Francisco Giant pitcher Yusmeiro Petit came within one strike of a perfect game, there actually was another pitcher the same evening who retired his 27th straight batter (the conceptual equivalent of a perfect game). That pitcher is Boston Red Sox reliever Koji Uehara, whose string of getting batters out has accumulated over nine appearances, most recently tonight against the New York Yankees. 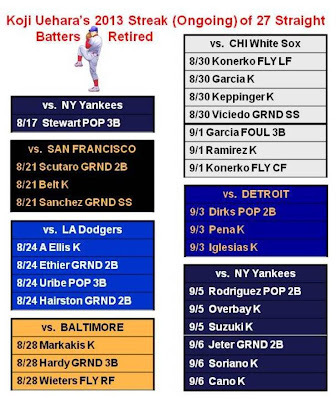 The following graphic (on which you can click to enlarge) displays the opposing teams, dates, batters, and types of out during Uehara's streak. What's interesting is that almost exactly a year ago, Uehara, then pitching for the Texas Rangers, retired 25 straight hitters. One criterion for being considered a streaky performer, according to some analysts, is the ability to record hot stretches on repeated occasions. Uehara thus seems able to get "on a roll," "in the zone," "on fire," or any similar term one chooses. The records for consecutive batters retired by a pitcher are 45 by Mark Buehrle (for a starter) and 41 by Bobby Jenks (for a reliever). Uehara still has a way to go to catch these marks. However, having separate streaks of 25 and (at least) 27, as Uehara has done, is extremely impressive. 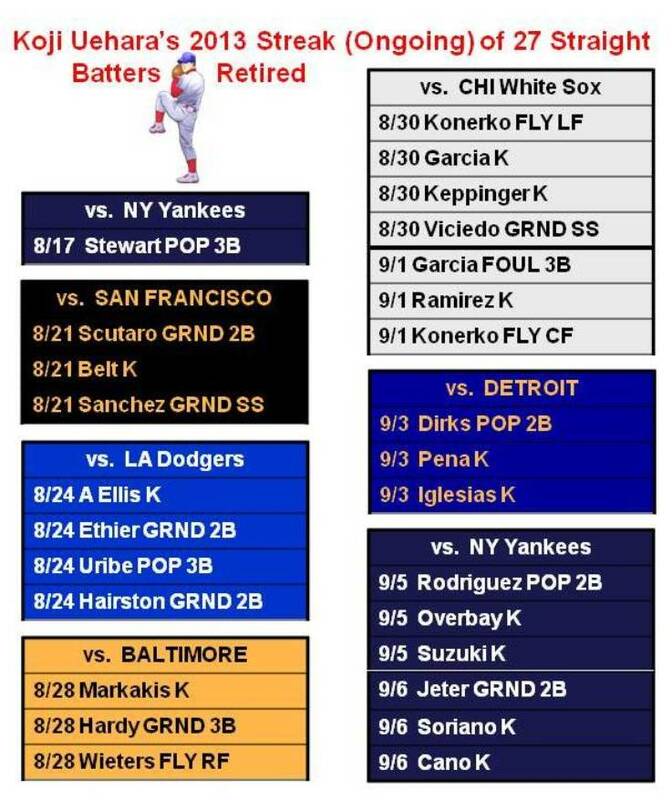 UPDATE 1: Bob Timmermann informed me that, "Kenley Jansen of the Dodgers also retired 27 straight batters this year from July 23 to August 8." Here's an article on Jansen's background and accomplishments. UPDATE 2: Uehara's streak reached 37 straight batters retired, until being snapped in a September 17 game against the Baltimore Orioles. With tonight's 7-1 win over the St. Louis Cardinals, the Pittsburgh Pirates advanced their record to 79-56. With 27 games left on the Pirates' schedule, it is a virtual certainty that they will win 82 or more games this season to clinch the franchise's first winning record (i.e., above a .500 winning percentage) after 20 straight years of losing records. I will track Pittsburgh's quest for a winning record on the following chart. With their 5-0 victory tonight in Philadelphia, the Los Angeles Dodgers have now recorded 42 wins in their last 50 games after, unbelievably it seems, starting off the season 30-42. It is truly an amazing turnaround. Winning this many -- or more -- times in any 50-game MLB stretch is a very rare occurrence, especially in recent decades. This online Sports Illustrated article includes charts documenting the all-time best records over 50 (and 45) games. The all-time best record over 50 contests is held by the 1906 Chicago Cubs at 45-5, followed by the 1912 New York Giants at 43-7. At 42-8, the Dodgers are tied for third-best, with the 1941 New York Yankees and 1942 St. Louis Cardinals. According to the SI chart, only four post-1954 squads other than this year's Dodgers have won at least 40 out of 50 games: the 1975 Cincinnati Reds and 1998 New York Yankees (41-9), and the 1977 Kansas City Royals and 2001 Seattle Mariners (40-10). The Oakland A's 2001 game-by-game log at Baseball Reference appears to show them going 40-10 within multiple 50-game stretches in the season (e.g., from having a 55-49 record at one point to later having a 95-59 record), but SI doesn't list them. By examining the logs of teams that had won 100 games in a season over roughly the past 15 years, I also discovered two teams that just missed 40-10; in 2002, the A's and Atlanta Braves each had a 39-11 stretch. Looking at the six 50-game stretches of 39-11 or better from 1998 to the present, there does not seem to be any consistent pattern in terms of when during the season the team got hot. The 1998 Yankees got hot very early in the season; after starting off 1-4, the next thing you knew they were 42-13. The 2001 Mariners also got rolling early on, building upon a 7-2 start to advance their record to 47-12. The 2002 Braves' 39-11 stretch (from 25-24 to 64-35) and the 2013 Dodgers' 42-8 spurt both were during the middle of the season. Finally, the Oakland A's two hot stretches (40-10 in 2001 and 39-11 in 2002) were both in the run-up to the end of the season. Coupled with a 13-game winning streak by idle Atlanta, this marks the first time in major league history that two teams have had winning streaks of at least 12 games at the same time during a season since May 16, 1884, STATS said. That was the only other time it occurred - the St. Louis Maroons had won 15 straight, the New York Gothams had taken 12 in a row. The L.A. Dodgers' hot streak has continued (see posting immediately below the current one). With their 3-2 win last night at St. Louis, the Dodgers are now 32-7 over their last 39 games. Further, the Dodgers have won their last 15 road games, one of the longest such streaks of all time. The record for consecutive road wins within a single season is 17, shared by the 1984 Tigers and 1916 Giants. The other team featured in my previous posting, the Tampa Bay Rays, have also remained hot, albeit a little less so than the Dodgers. The Rays are 6-3 since the last posting, making them 25-6 from June 29 onward. Also, in my previous posting, I wrote with reference to the National League West around the time the Dodgers began making their climb: "I don't know how many previous instances there have been within a division of all or most of the teams concurrently winning or losing 80% (or more) of their last 10 games, but I suspect it's pretty rare." Well, maybe it's not as rare as I imagined. Just recently, after play on August 4, in the American League Central, here's how the teams stood after their respective last 10 games: Detroit 9-1, Cleveland 9-1, Kansas City 9-1, Minnesota 5-5, and Chicago White Sox 0-10. From July 26-August 2, Atlanta Braves third-baseman Chris Johnson maintained a streak of getting multiple hits in each of eight straight games. Johnson was far from the record, which is 15 straight multi-hit games, but eight straight is still pretty impressive. 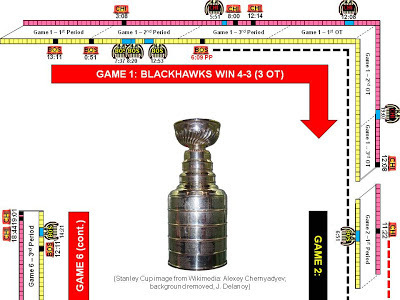 This year's NHL Stanley Cup finals between the victorious Chicago Blackhawks and the Boston Bruins, which ended a little over a week ago, contained some streak-related developments. To depict these streaks, as well as experiment with information graphics more generally, I created the diagram below. Just start reading in the upper-left corner (corresponding to Game 1, Period 1) and follow the path clockwise, through Games 2, 3, 4, 5, and 6. 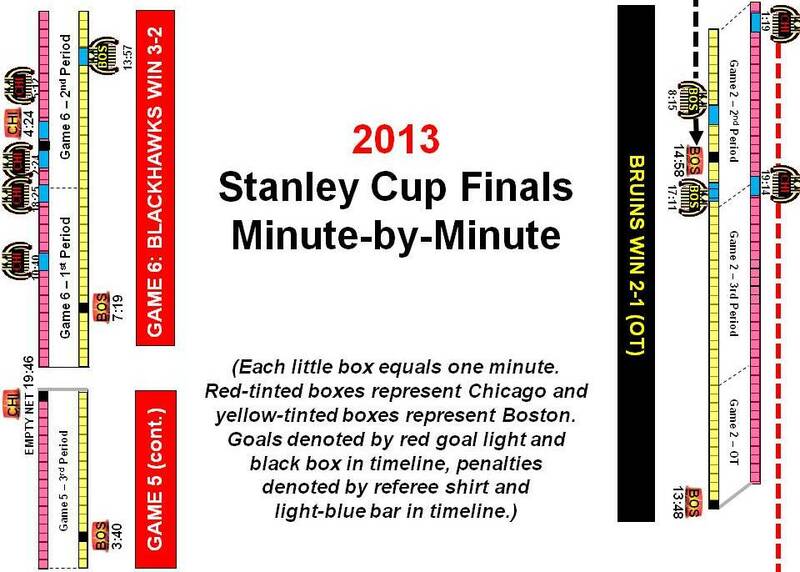 Each little box (tinted red for Chicago and yellow for Boston) represents one minute. Goals are depicted by red goal-light symbols and black boxes in the timeline, whereas penalties are denoted by referee-shirt logos and light-blue bars in the timeline. You can enlarge the graphic by clicking on it. Because of the diagram's size, I had to divide it into three sections (top, middle, and bottom), so you'll have to click on each section separately to enlarge it. Each team went through a major scoreless streak during the series. The Bruins didn't score for a span of 100 minutes and 57 seconds (starting roughly 6 minutes into the third period of Game 1 and ending nearly 15 minutes into the second period of Game 2). This stretch is depicted via the dashed black line. The Blackhawks later topped that, experiencing a scoring drought of 129 minutes and 14 seconds; after scoring at the 11:22 mark of the first period of Game 2, Chicago didn't light the lamp again until nearly 7 minutes into Game 4. This span is shown with a dashed red line. Another offensive difficulty for the Hawks was the power play; for the series as a whole, they scored on only 1 of 19 instances in which the Bruins had a man in the penalty box (a few times, a Chicago player was sent off at the same time as a Boston player, which would not be a power play). The most memorable aspect of the series would have to be the closing moments. 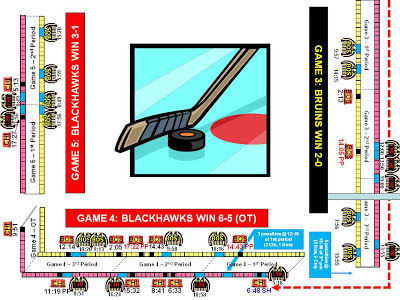 The Blackhawks led the series 3 games to 2, but trailed in the closing minutes of Game 6 by a 2-1 score. Chicago then stunned Boston with two goals just 17 seconds apart (with 1:16 and 0:59 remaining) to win 3-2. Tom Tango cited an estimate that Chicago had only a 3% chance of winning the game before its late outburst and noted the oddity of both teams being in a position to pull its goalie in the same game (a team down a goal in the closing minutes will almost always bring its goalie to the bench to substitute in a sixth attacking player). Weird things can happen in hockey (see this video of quick goals), but Chicago's manner of clinching this year's Cup is one for the ages. Several streak-related stories are swirling through Major League Baseball at the season's halfway point (81 games). These stories involve a team, two hitters, and a pitcher. Which team has the best record? Hint: It's a team that has recorded sub-.500 records for each of the last 20 years. Yes, it's the Pittsburgh Pirates. Pittsburgh has won nine straight games and has the best record in MLB at this point, 51-30 (.630). The Bucs now need to go only 31-50 (.383) the rest of the way to end their streak of losing seasons. Last year, however, Pittsburgh was in an even more advantageous position to post a winning record -- a 63-47 record as of August 8, which required playing at only a .365 clip the rest of the way -- but still finished with a losing record. Of the two hot hitters, one is capturing the imagination of baseball fans as he helps lift his team back into playoff contention, whereas the other has quietly put together a long consecutive-game hitting streak. The first one is Yasiel Puig, a Los Angeles Dodgers outfielder from Cuba. Puig just completed the first month of his rookie year (June) with more hits (44) during a first month than any player in MLB history, except for Joe DiMaggio (48). However, Puig bested Joltin' Joe in three important offensive categories during the two players' respective first months: batting average (.436 to .381), on-base percentage (.467 to .400), and slugging percentage (.713 to .659). Puig did strike out more times (20 to 8) than DiMaggio during their respective first months. Neither walked much (Puig, 4; DiMaggio, 3). Based on Puig's game-by-game log, I made the following table, which shows that, in the majority of his June contests (14 out of 22), he's gotten multiple hits in a game. The quietly successful hitter is Colorado Rockies outfielder Michael Cuddyer, who yesterday got a hit in his 27th straight game. Cuddyer's streak has taken place from May 28-June 6 and (after missing five games) from June 13-30. His monthly batting averages have been .313 in April, .396 in May, and .347 in June. Even if we assume conservatively that Cuddyer is truly a .300 hitter this year, he still has a .760 probability of getting at least one hit per game if he gets four official at-bats (1 - [.700^4], where .700 is his probability of making an out in each official at-bat, which is then raised to the fourth power). Finally, Detroit Tigers pitcher Max Scherzer has gotten a lot of attention for his 12-0 win-loss record to start the season, the first hurler to do so since Roger Clemens in 1986. Many baseball observers (your author included) do not like win-loss record as a metric of pitcher accomplishment, because much of what determines whether a pitcher will win or lose is his teammates' offensive output. As we see in Scherzer's game-by-game log, he has gotten wins in games in which he has given up 4 earned runs in 5 innings (April 6), 5 ER in 5 innings (April 24), and 4 ER in 5 innings (May 10). In fact, Scherzer currently ranks 12th among American League pitchers in Earned Run Average (ERA), at 3.10. On another pitching metric, WHIP (walks and hits per inning pitched), Scherzer does better, his .90 placing him second in the AL, only slightly behind Seattle's Hisashi Iwakuma (.88). With last night's Game-5 victory over the Miami Heat to take a 3-2 series lead, the San Antonio Spurs now need only a single victory to claim the NBA crown. However, Tuesday's Game 6 and (if necessary) Thursday's Game 7 will be played in Miami. Thus, the Spurs have the momentum, whereas the Heat has the home court. How much are these respective, putative advantages worth in an NBA final series? The sample size of historical NBA finals matching the circumstances of this year's Heat-Spurs match-up is small. 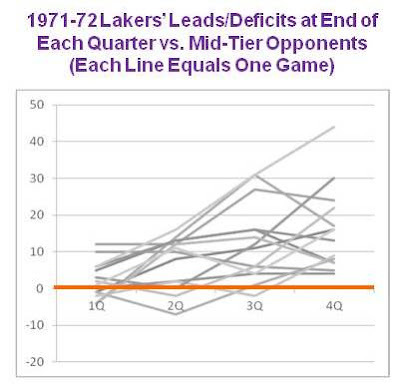 Still, let's take a look at similar series over the years. 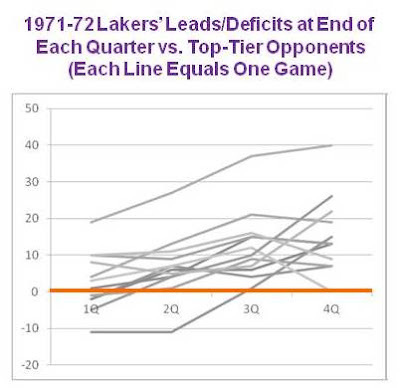 It should first be noted that the current 2-3-2 finals format (i.e., two games at the home of the team with the better regular-season record, the next three games at the opponent's home, and the final two back in the first city) began with the finals of the 1984-85 season. Here are the final series since then in which a team has won Game 5 (abbreviated "G5") at home to take a 3-2 lead, and then sought to win the title on the road (data from here). As seen in the table, it's a wash: Three teams (shown in red) used their home Game-5 victory as a springboard to close out the series on the road in six games, whereas another three Game-5 winners at home (shown in blue) never got the clinching fourth win. Two Michael Jordan-era Chicago Bulls squads entered a road Game 6 with a 3-2 lead in the finals and won the title in six, both times. However, those two experiences -- vs. Phoenix in 1992-93 and vs. Utah in 1997-98 -- are different from those in the table above. In both cases, the Bulls had led 3-1 and failed to close out the series at home in five. We can expand the database by looking at years prior to the switch to 2-3-2, in which a 2-2-1-1-1 format (usually) was used for the finals. Under this format, a team that won Game 5 at home to go ahead 3-2 had the opportunity to wrap up the series on the road in Game 6 (although the home team for Game 5 knew that it would also play Game 7 at home, if necessary). Staying within the past 50 years, there were eight series in which a team won Game 5 at home to take a 3-2 lead and then went on the road for Game 6 (but not Game 7). They are as follows. Year Won G5 @ Home Opponent Won G6 on Road? *Winner of Game 5 won Game 7 back at home. Again, it's a wash. Four teams (shown in dark green) won Game 5 at home to take a 3-2 lead and then captured the title on the road in Game 6. However, another four similarly situated teams (shown in orange) failed to do so. If we assume that a road team in basketball usually has less than a 50/50 probability of winning, then the fact that a team that won Game 5 at home to take a 3-2 lead won Game 6 on the road 50% of the time in the above years suggests that there may be something to the notion of momentum in this context. There's a (somewhat) complicating factor, however. With the 2-2-1-1-1 format (prior to 1984-85), the road team in Game 6 would have been the team with the better regular-season record and thus arguably the better team. That may be why Game-5 winners may have done well in Game-6 road contests, as much or more so than benefiting from momentum. In the 2-3-2 era, in contrast, the road team in Game 6 would be the one with the worse regular-season record. Hence, a 50% success rate for such teams in Game 6 speaks well for momentum. See update after 2015 Australian Open. Serena Williams brings a career-best 30-match winning streak into tomorrow's women's singles final of the French Open -- and a 12-match winning streak in head-to-head matches against her opponent tomorrow, Maria Sharapova. 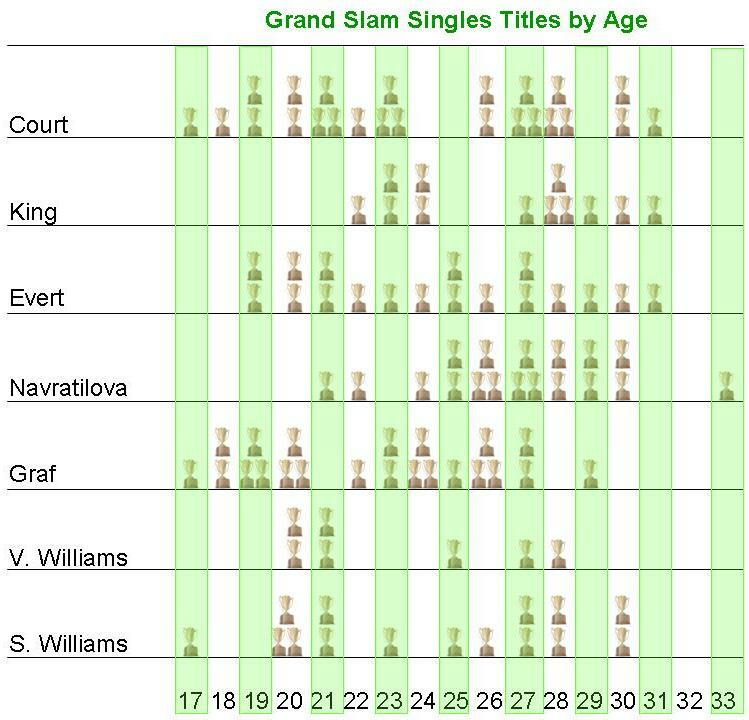 Williams presumably will be a heavy favorite to win this Grand Slam event, but even if we just look at what she has accomplished in the last few months of non-Grand Slam tournaments, it's still pretty remarkable. First, Williams is a power player, with the New York Times quoting multiple experts that her serve is the best ever in the women's game. Yet, her 30-match winning streak has occurred mostly on clay, a surface that slows the ball down. In fact, of Williams's 15 Grand Slam titles to date, only one has come at the French Open (2002), which is played on clay. The other 14 have come at the Australian Open, Wimbledon (All-England), and U.S. Open championships, which are played on faster surfaces. Second, Williams is currently 31 years old, a seemingly advanced age at which to embark on a career-longest winning streak. The study of baseball statistics ("sabermetrics") has produced "age curves" of players' productivity over time. I was not familiar with age curves for tennis, so I created a rough estimate of them for seven all-time great women's tennis players: Serena and her sister Venus Williams, Margaret Court, Billie Jean King, Chris Evert, Martina Navratilova, and Steffi Graf. You may click on the following graphic to enlarge it. 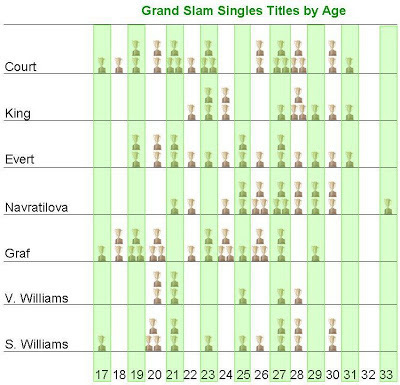 To arrive at these players' ages at which they won Grand Slam tournaments, I compared their dates of birth to these rough guidelines of when the finals of the four tourneys are held: Australian, early January; French, early June; Wimbledon, early-mid July; and U.S. Open, early September. The Australian Open has switched back-and-forth between December and January, but I used January throughout my analyses. Thus, it's quite possible that I could be off a year on some of these players' ages. The main finding appears to be that most of the great women's tennis players of the modern era have tended to tail off beginning in their late twenties. Serena, in contrast, had some (relatively) lean years in her mid-twenties (three Grand Slam titles in the five years from ages 22-26), before experiencing a renaissance from ages 27-30 (six titles in four years). The way Williams is playing, and with the upcoming switch to grass-court tournaments leading up to Wimbledon, I wouldn't rule out anything for her. Following up on an earlier posting, Dutch tennis player Robin Haase finally ended his tie-breaker losing streak, which had reached 17 (under the policy of excluding anything that occurred in a qualifying-round match). Playing in the first round of the French Open against Kenny De Schepper of France, Haase prevailed in a tie-breaker at the end of the second set, by a 7-3 score; Haase also prevailed in the match as a whole, three sets to one. 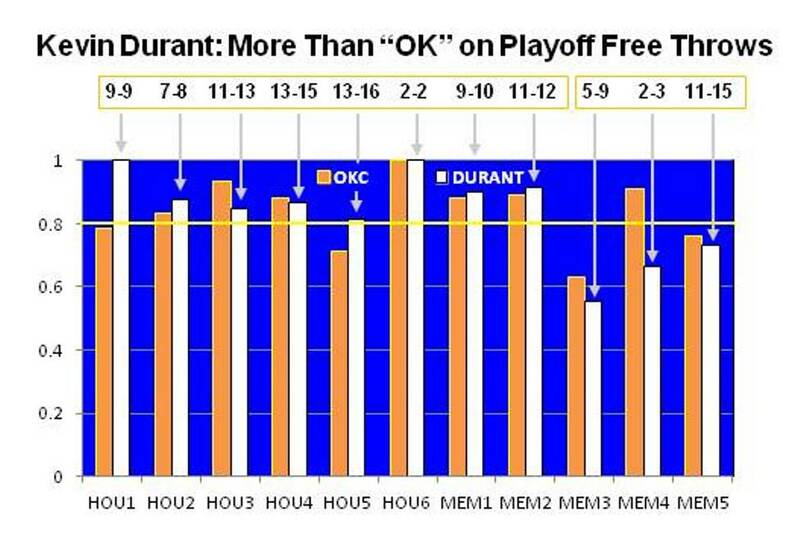 His Oklahoma City Thunder squad was eliminated in the second round of the NBA playoffs by Memphis, but Kevin Durant's postseason free-throw shooting showed an interesting trend that I thought might be of some interest. Durant first crossed my radar screen early in his career, specifically when he played against Texas Tech in Lubbock as a University of Texas freshman in 2007. Standing 6-foot-9 and sporting a deadly three-point shot, Durant fits into what one sportswriter calls the "Stretch 4" category of big guys who can shoot from outside. As can be seen, however, Durant's free-throw accuracy dipped in the final three games against Memphis. In his first eight playoff games (all six against Houston and the first two vs. Memphis), Durant never fell below .800 in any individual contest; cumulatively in these first eight games, he shot .882 (75/85). In Durant's (and the Thunder's) final three games, in contrast, he never reached .800 in any contest and shot a cumulative .667 (18/27). Just a blip? Possibly. Fatigue? Maybe. 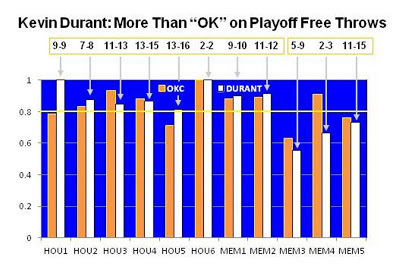 One could do a statistical comparison of Durant in his first eight vs. his last three playoff games. 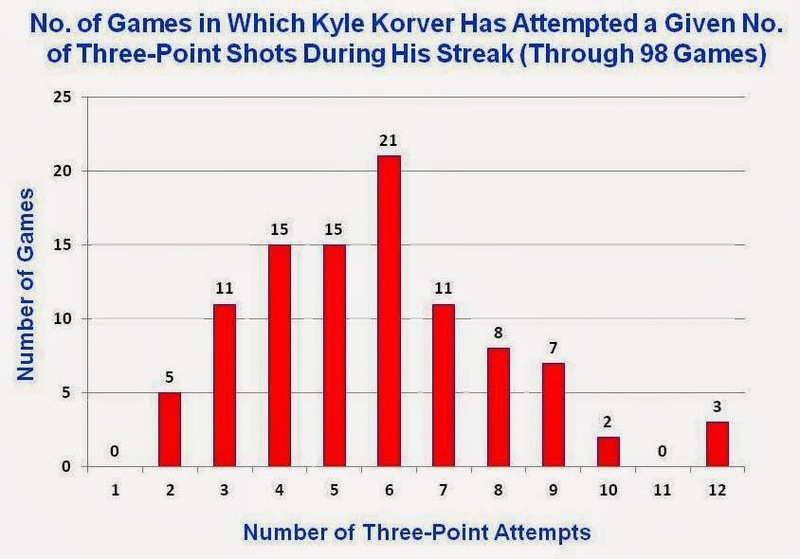 However, most statisticians would probably consider such a test to be "cherry-picking" (deciding to conduct a test only after seeing a sharp drop in Durant's free-throw accuracy). Lionel (Leo) Messi, an Argentinian who plays in Spain for FC Barcelona in the Spanish football/soccer league ("La Liga"), had his 21-game goal-scoring streak ended on May 12. According to this article: "His streak of scoring in his last 21 consecutive league games started on 11th November last year, in an away league match against Mallorca, where he scored 2 goals. With no goal from Leo today, the longest-ever streak of scoring in a league ended." The same article lists how many goals Messi scored in each of the 21 games during the streak. For the first six games of the streak, he scored two goals (known as a "brace") in each outing. He scored one goal in each of the next four games, then erupted for four goals in a January 27 game against Osasuna. In the final 10 games of the streak, Messi scored a single goal seven times and a brace three times. All told, he scored 33 goals during the streak, 1.57 per game. Probably like most U.S. sports fans, I get most of my exposure to international soccer through the quadrennial World Cup. I recall that the 2010 World Cup had many 1-0 scores, which made me wonder if goals were similarly rare in La Liga. If so, Messi would not only be a great soccer player, but also a miracle worker. Looking at FC Barcelona's 2012-13 game-by-game log (with La Liga contests denoted by a color-wheel logo and the word "league"), the team has averaged 3.03 goals in league games, as of this writing (109 goals in 36 games). Thus, whether it's the relative abilities of offensive and defensive players or the style of play, La Liga appears much more conducive to scoring than World Cup competition. Don't get me wrong. Even in an apparently offense-friendly league, what Messi has done is unprecedented -- by a wide margin, as the previous La Liga consecutive scoring record was 10 games. Also, as noted in the linked article in the previous paragraph, Messi also has set a scoring record when competing for Argentina in international play, so his scoring ability clearly transcends any particular league. No other active player has a streak of more than seven, and no tour-level regular has lost more than his last six. In fact, Haase is now one lost tiebreak away from tying the all-time ATP [Association of Tennis Professionals] record of 14, jointly held by Graham Stilwell and Colin Dibley, two players who accomplished their feats in the 1970s. With a 1-6, 6-2, 6-7 loss to Pablo Carreno-Busta on April 22, Haase has, in fact, now technically tied the record of 14 straight lost tie-breakers. Why do I say "technically"? If one peruses the ATP World Tour website for Haase's results, starting with the most recent ones and working backwards in time, one counts "only" 12 lost tie-breaks before noticing a breaker that he won. This win by Haase occurred on May 13, 2012 at the ATP World Tour Masters in Rome, as he beat Sergiy Stakhovsky, 6-4, 7-6 (11-9). Prior to winning that tie-breaker, Haase had lost his two previous ones. The reason Haase's streak is officially listed as being 14, Sackmann has confirmed, is that the tie-breaker Haase won over Stakhovsky occurred in a qualifying-round match (note the "Q1" on the ATP site), not the tournament draw proper. If the ATP's policy has always been that only main-draw matches count for record purposes, so be it. Perhaps the thinking is that, because the level of competition presumably is less demanding in the qualifying rounds than in the main draw, only the latter should be counted for record purposes. Let's be clear, though: Whether one considers Haase's tie-breaker losing streak to be 12 or 14, it's unusually long in either case! 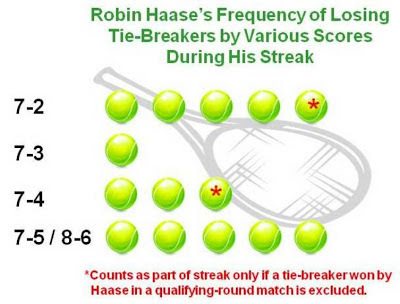 The reason I was looking up all of Haase's matches, in the first place, is that I was curious with regards to how many points he was garnering in the tie-breakers during his stretch of futility. Has he been getting blown out in them (e.g., 7-0, 7-1, 7-2)? That might suggest a major freeze-up. Or, on the other hand, has he been taking his opponents to the wire, losing the tie-breakers by the minimum two points (e.g., 7-5, 8-6, 9-7)? If the latter, Haase wouldn't be experiencing full implosion at the umpire's call of "Games are tied at 6-all," but one would still have to wonder why he consistently lost close tie-breakers. I created the following graph to show Haase's frequency of different point totals in tie-breakers during his losing streak. The picture is mixed, yielding what statisticians call a bimodal distribution (i.e., two values tied for being most frequent). Five times, Haase was blown out 7-2, whereas he lost another tie-break 7-3. However, he has also stayed within two points on five occasions, losing 7-5 (twice) or 8-6 (thrice). 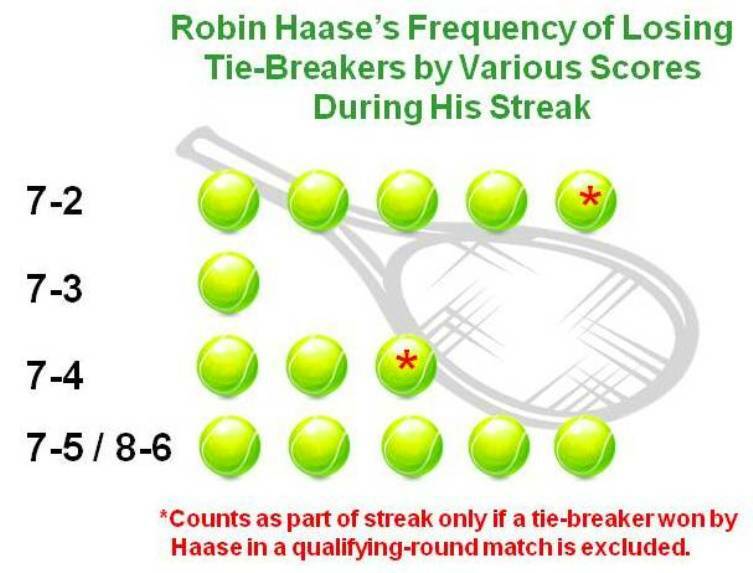 Sackmann has done extensive research on the likelihood of winning tie-breakers, which you can find by following the links in his various Heavy Topspin postings (e.g., here). Sackmann has developed formulas for how many tie-breaks a given player would be expected to win, given the player's success for entire matches at winning points on serve and receiving. Players with better-than-average skills should win more than 50% of tie-breakers, whereas those with less-stellar skills should win fewer. Sackmann finds that, "Aside from a small minority of players with extensive tiebreak experience (such as Roger Federer, John Isner, and Andy Roddick), ATP pros tend to win about as many breakers as 'expected.'" The 2013 Major League Baseball season is a couple of weeks old and we now see which teams have gotten off to the hottest starts: the Atlanta Braves (13-2), the Oakland A's (12-4), and the Boston Red Sox and Colorado Rockies (each 11-4). To some extent, one could say that there always seems to be a team or two starting off with a bang every year. Last year, for example, the Rangers started off 15-4, whereas the Dodgers began with a 12-3 burst. However, if the Braves, A's, Red Sox, or Rockies can continue to mow down opponents, they may be able to join the pantheon of teams with all-time great starts. This 2011 Yahoo! Sports article lists "Five of the best starts in baseball history." Three of them might be considered fabulous long-term starts: 30-5 by the 1902 Pirates, 33-7 by the 1939 Yankees, and 35-5 by the 1984 Tigers. * The other two great starts were over a shorter term: 13-0 by the 1982 Braves and 17-1 by the 1987 Brewers. Justin Upton has already clubbed a league-leading eight home runs, and Evan Gattis — who is supposed to just be a placeholder for the injured Brian McCann — has shown impressive pop at the plate. [Chipper] Jones’ replacement Chris Johnson is hitting over .400 to start the season — Chipper who? Freddie Freeman is also over the .400 mark to start the year. The starting pitching staff has been great so far. Through his first three starts, Paul Maholm has not given up a run — earned or unearned — in 20 1/3 innings. Tim Hudson, Kris Medlen and Mike Minor have also looked good early. Where the Braves definitely have the Nationals beat is in the bullpen. Closer Craig Kimbrel is perfect in save opportunities and has only allowed two hits and two walks (no runs) in 6 2/3 innings of work. For Oakland, a fast start seems almost out of character, as recent A's squads have tended to be at their best in the second half of the season. The A's had a hot July last year and also did very well in August during several seasons in the 2000s. We also, of course, have seen some terrible starts to the 2013 season. Not surprising is that of the Miami Marlins (3-13), who undertook an off-season fire sale. More surprising is the start of the superstar-laden Angels (4-10). *In fact, I have a chapter in a new book about the '84 Detroit squad. With 3:02 remaining in the first half of Monday night's NCAA championship game and Michigan leading 35-23, Cardinal coach Rick Pitino called a time-out. Hot shooting from behind the three-point arc -- including four straight shots without a miss by reserve guard Spike Albrecht -- had given the Wolverines their sizable lead at this point. However, in a two-minute stretch that will give Michigan fans nightmares for years to come, Louisville's Luke Hancock hit four straight treys of his own and, next thing you knew, the teams were heading to the locker room with the Wolverines ahead only 38-37 at intermission. So compelling was the first-half three-point duel, it inspired the New York Times to write a human interest story on Hancock and Albrecht. Based on the play-by-play sheet of the Louisville-Michigan game, I have graphed all three-point attempts of the first half. The chart indicates which player (by last initial) took each shot (UM players depicted in blue and UL players in red), with how much time remaining in the half, and whether the shot was good (bright colors in top row) or a miss (lighter colors in bottom row). You may click on the graphic to enlarge it. Though Albrecht and Hancock each hit four first-half threes, as can be seen, Hancock's occurred in much quicker succession. Also, until Hancock's shooting outburst, Michigan had made six treys to only one for Louisville. Louisville dominated the second half except for some brief stretches, with Hancock hitting a fifth three-pointer to put the Cardinals up 76-66 with 3:27 left in the game. The final score was 82-76 for UL. Hancock went 5-for-5 from downtown in the title game, as well as 3-for-5 on treys vs. Wichita State in the national semifinal, giving him an impressive 8-for-10 three-point shooting percentage in the Final Four (see Hancock's game-by-game log). Such a shooting performance by Hancock in the biggest games of the season would have seemed very unlikely, however, based on his start to the 2012-13 campaign. A transfer from George Mason University whose Louisville career began last fall, Hancock compiled an ugly 9-of-41 (.220) record on three-point attempts in his first eight games. Though he later had some good three-point shooting games (e.g., 4-of-5 at Syracuse on March 2), Hancock entered the Final Four (including the regular season, Big East tournament, and first four games of the NCAA tournament) hitting only 55-for-148 (.372) from downtown. One can calculate the probability of a prior .372 shooter hitting 8 (or more) of his next 10 three-point attempts, using what is known as a binomial probability calculator. This probability turns out to be .007, a little less than 1-in-100. Unlikely, but not astronomical. What about Michigan's Albrecht? As his game-by-game log shows, Albrecht attempted far fewer three-pointers during the season than did Hancock. In fact, until Monday night's championship game, the frosh Albrecht had never attempted more than 2 three-point shots in a single game. For the regular season and Big 10 tournament combined, Albrecht made 9-of-23 (.391) behind the arc. In the Wolverines' NCAA tournament opener vs. South Dakota State, Albrecht didn't attempt any treys. In each of the next three tournament games -- vs. Virginia Commonwealth, Kansas, and Florida -- Albrecht went 1-for-1 on three-pointers. In the national semifinal vs. Syracuse, Albrecht upped his three-point output to 2-for-2. He then, of course, hit his first 4 shots from beyond the arc in the title game against Louisville, making him 9-of-9 for the entire NCAA tournament at that point. With 11:28 left in the game, Albrecht missed a three-point shot that would have put UM, then trailing 52-54, back in the lead. The miss was the only mar on Albrecht's tournament three-point record, which ended up 9-for-10. Returning to the binomial probability calculator, we ask in Albrecht's case what the probability is of a prior .391 shooter making 9 (or more) of his next 10 three-point shots. That probability is .001 or 1-in-1,000. Clearly, two rare performances were on display Monday night! Bill Simmons offers a lengthy postmortem on the Miami Heat's 27-game winning streak, which ended last Wednesday in Chicago. 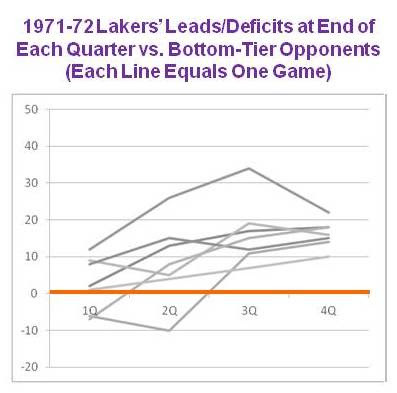 UPDATE (4/4/2013): Arturo Galletti offers a statistical comparison of the three longest NBA winning streaks in history (1971-72 Lakers' 33 games, 2012-13 Heat's 27, and 2007-08 Rockets' 22). Conditions faced by these teams, such as difficulty of opposition during the respective streaks, were not necessarily equal. Therefore, Galletti looks at power-rankings, among other stats, to try to quantify the impressiveness of the three streaks. The Pittsburgh Penguins won their 14th straight game last night, shutting out the Winnipeg Jets, 4-0. Three of the 14 games were tied after regulation play, with the Pens winning two of them during the five-minute sudden-death overtime period and one in the post-overtime shoot-out (game-by-game log). The longest winning streak in league history is also held by the Penguins franchise, as the 1992-93 squad won 17 straight. Looking at the Penguins' 1992-93 game-by-game log, we see that the winning streak occurred from March 9-April 10, 1993, and that two of the wins occurred in overtime. 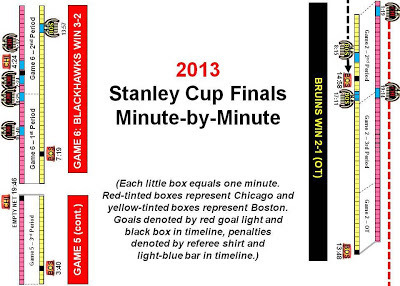 Five-minute overtime was introduced in 1983-84, which meant games could still end as ties. Shoot-outs to determine a winner, if the overtime period had not, began in 2005-06 (click here for a history of hockey overtime rule changes). In the pre-overtime era, in which games could end as ties after 60 minutes, the NHL record winning streak was 15 games by the 1981-82 New York Islanders (January 21-February 20, 1982). Arguably, the Islanders' streak is more impressive than the '92-'93 Penguins' streak, due to the overtime rule changes. Had the rules in '92-'93 been such that deadlocked games after regulation been entered into the books as ties, the Penguins would have won only 12 straight. UPDATE: The Penguins extended their winning streak to 15 games, but then lost 4-1 to Buffalo on April 2. With the Chicago Bulls' 101-97 victory over Miami last night, the Heat's winning streak has fallen six short of the NBA record 33-game mark set by the 1971-72 Los Angeles Lakers. My primary impression from the Heat-Bulls game is that Miami never got the late barrage of three-point shots that had carried it to victories in other games during the streak. The Heat shot only 7-of-20 for the game from behind the arc. Four of these made shots occurred in the second half. Miami did experience a little boomlet of three-point success late in the third quarter, when it was either tying or taking a one-point lead in the game. According to the play-by-play sheet, Mario Chalmers hit a three with 5:31 remaining in the third, followed by a pair of Shane Battier treys at the 4:30 and 2:25 marks of the third. What followed were seven straight Miami misses from downtown, until Chris Bosh made a three with just five seconds left in the game. Against Orlando (win number 27), the Heat went 7-of-10 from long distance in the final 15 minutes of the game. Against Cleveland (win 24), Miami hit 6-of-7 treys during a fourth-quarter stretch in scoring an amazing comeback win. Four three-pointers in roughly a two-minute span helped Miami put away Toronto (win 22). The Miami Heat has now won 27 straight games, just six shy of tying the 1971-72 L.A. Lakers' NBA-record winning streak of 33 games. The Heat is next in action Wednesday at Chicago. However, the Denver Nuggets didn't fare so well in their attempt to extend their 15-game winning streak, falling 110-86 to New Orleans. 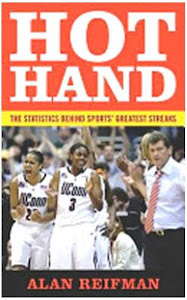 Women's collegiate hockey doesn't get a lot of attention here on the Hot Hand website. However, the University of Minnesota squad definitely made news yesterday, winning its second straight NCAA title and, in the process, its 49th straight game. This season's Gophers went 41-0, building upon the eight straight wins with which the 2011-12 team finished the season. A big fourth-quarter run has become the Miami Heat's modus operandi of late, as the team's winning streak has now reached 23 games, the second longest in NBA history. After using a 28-4 spurt Sunday to finish off Toronto, the Heat needed a big comeback at Boston Monday night -- and got it. Trailing 96-83 to the Celtics with 8:26 left in the game, LeBron James hit a three, kicking off a 9-0 Miami spurt to cut the deficit to 96-92. After a Boston trey, the Heat went on a 9-1 run to take a 101-100 lead with 2:40 left. Things were tight the rest of the way, with a long two-point jumper by James putting the Heat ahead 105-103 with 10 seconds left. The lead stood, as a final Celtic three-point attempt bounced off the rim. Click here for the fourth quarter play-by-play sheet. According to a chart accompanying ESPN.com's game article, Miami's 17-point deficit in the first half last night was the team's largest during the streak. 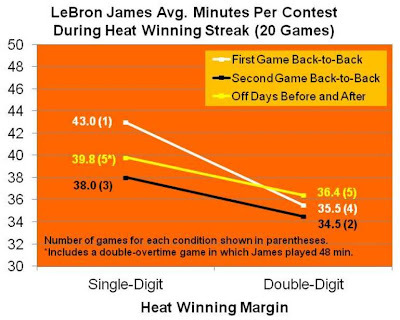 The Heat also has faced deficits of 16, 14, and 11 during the streak. Not many games during the streak have gone to the wire, but when they have, James has come through with game-winning shots. Not only last night, but also in a 97-96 win over Orlando on March 6, did he score the go-ahead points. Where does James rank among the league's best "clutch" players? The website 82 Games keeps various kinds of statistics on clutch performance. For the most recent full season of available data (2011-12), on one measure of performance under pressure, namely point-production per 48 minutes of "clutch time," James ranked 17th in the league. On another measure, shooting percentage on potential game-winning shots (based on statistics through 2009), James's .340 ranked behind several players, including Carmelo Anthony (.481) and Ray Allen (.385). Historically, James has shown the ability to take over a game completely down the stretch. The 82 Games statistics may take account of this somewhat, but not totally. The Heat is not the only NBA team with a long winning streak. The Denver Nuggets won their 12th straight last night. With yesterday's 108-91 victory over the Toronto Raptors, the Miami Heat extended its winning streak to 22 games, tying for the second-longest such streak in NBA history. 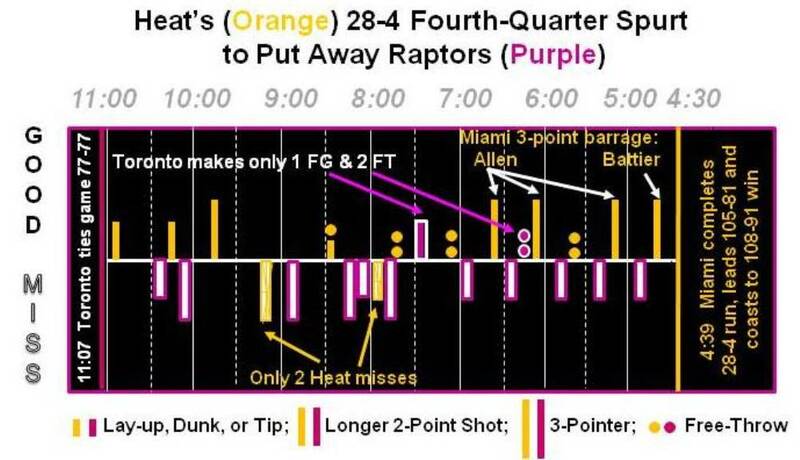 The key to Miami's win over Toronto was explosiveness based on three-point shooting. It's a familiar theme for the Heat, which used success from behind the arc to win the NBA finals last year. Going back to yesterday's win, the Heat ran off a 28-4 spurt in roughly a six and one-half minute segment of the fourth quarter to put away the Raptors. Based on the fourth-quarter play-by-play sheet, I have charted all field-goal and free-throw attempts by both teams during this stretch in the following graphic (which you may click to enlarge). 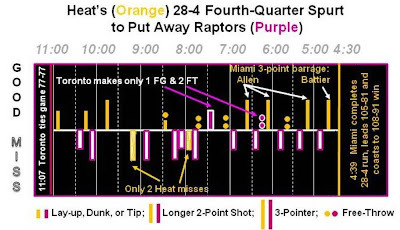 The graphic attempts to depict time (minutes left shown in grey), team (Miami orange, Toronto purple), shot distance (length of bars, see legend below), and shot success (upper-half represents "good," and lower-half, missed shots), all at a glance. Above the white horizontal line, the solid shapes for made shots are far more prevalent for Miami (orange) than for Toronto (purple). Ray Allen's burst of made three-pointers at the 6:37, 6:07, and 5:09 marks is highlighted, as are Toronto's mere four points. Below the white line, in contrast, the outlined shapes for missed shots are far more prevalent for Toronto than Miami. For whatever reason, the Raptors were not getting (or choosing to take) shots near the bucket, as all their field-goal attempts during the stretch were long two-pointers and three-pointers. The Heat has a quick turnaround, facing the Celtics in Boston tonight. 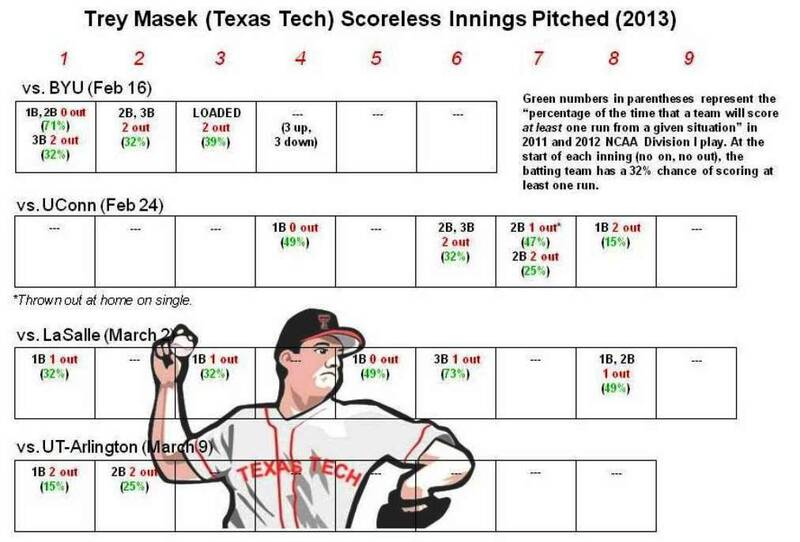 Texas Tech pitcher Trey Masek has pitched 32 innings so far this college-baseball season without giving up a run: six innings against BYU, nine each vs. UConn and LaSalle, and eight against the University of Texas-Arlington (clicking on the opponent's name will take you to the play-by-play sheet for that game). The following graphic (which you may click to enlarge), shows threats Masek has faced (e.g., runners on second and third with two out) by game and inning. I've incorporated into the chart an important element, namely the likelihood of a batting team scoring at least one run for a given outs/runners situation. These probabilities come from the Boyd's World college-baseball statistics website, based on huge amounts of Division I data from 2011-2012. For example, in Masek's very first inning of the season, vs. BYU, he allowed the Cougars to have runners on first and second with no outs. The average team, based on the Boyd's World statistics, would have a 71% probability of scoring at least one run in that scenario. Yet Masek got out of the jam. 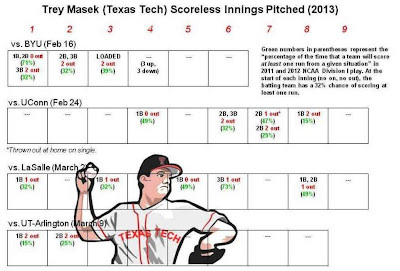 Masek has faced six situations thus far in which the opponents had a 47% or better chance of scoring (which includes two instances of opponents having scoring probabilities in the 70s). The closest Masek has come to giving up a run was when a UConn batter hit a single with a runner on second in the seventh inning; the runner was thrown out at the plate. The NCAA Division I record for consecutive scoreless innings pitched within the same season is 47, by Todd Helton of the University of Tennessee in 1994. Helton, of course, went on to a long and productive major-league career as a first-basemen for the Colorado Rockies. There was one longer streak that carried over from one season to the next, with George Plender of Vermont putting 60 straight zeroes on the scoreboard in a span that encompassed the 1954 and '55 seasons. Masek's next scheduled outing is Saturday afternoon against Texas in Austin, as Big 12 conference play begins. UPDATE: Masek gave up a run in the first inning to the Longhorns, ending his scoreless pitching streak at 32 innings. However, he quickly resumed his old way, shutting out Texas in the remaining innings he pitched (the second through eighth innings). Hey, one run allowed in 40 innings isn't bad! A theme I've discussed in writing about basketball winning streaks is that, the more the streaking team can blow out opponents, the more it can rest its star players. With the Miami Heat's winning streak now at 20 games after last night's victory in Philadelphia, I decided to examine LeBron James's minutes played in each game during the streak. As seen in the following graph, I divided the games into those the Heat won by single-digit and double-digit margins. (I included the Heat's double-overtime 141-129 win over Sacramento as a single-digit game, as the game would have been close down the stretch.) Another factor that may affect James's (and other NBA stars') minutes played is opportunity for rest between games. Accordingly, I divided games into three categories: first game of two on back-to-back days; second game of a back-to-back; and at least one off-day before and after the game. Here are James's average minutes played as a function of win-margin and game-scheduling. A couple of trends are apparent in the graph. First, if we look at the yellow (off-days before and after) and black (second game of back-to-back) lines, James gets three and one-half extra minutes of rest when the Heat is winning handily. (The difference is even greater for the white line, representing first games of back-to-back situations, but there is only one observation for single-digit games of this type.) 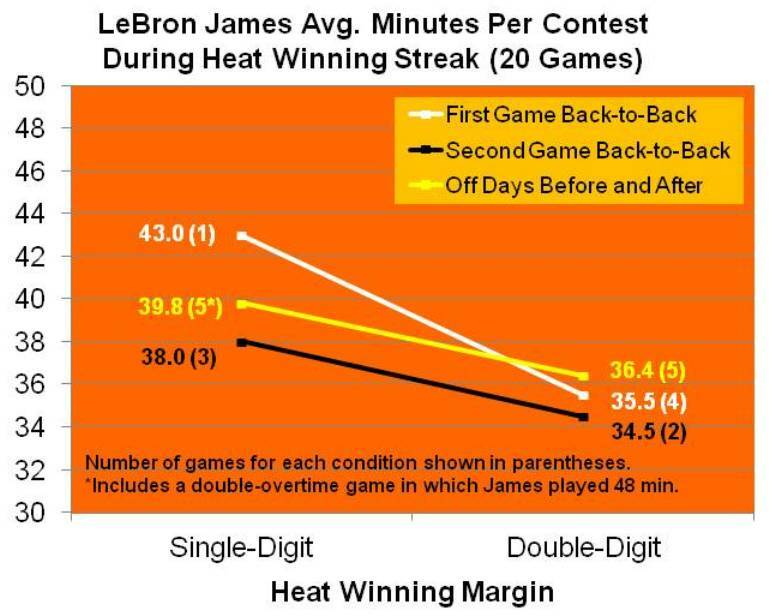 Also, regardless of victory margin, James plays about two minutes fewer in second games of back-to-back scenarios than in games surrounded by off-days.